Cliffwalk has been one of Newport’s most popular tourism spots since it was created in 1975 as a National Recreation Trail. It’s a 3.5 mile walkway along the Newport shoreline. It begins off Memorial Boulevard, right before Easton’s beach, and finishes on Bellevue Avenue, by Bailey’s Beach. There are a variety of other access points for Cliffwalk such as Ruggles Avenue and Narrangansett Avenue. Most of the trail has easy walking conditions, but some parts are rockier, and walkers should wear proper shoes and be aware where they’re walking. 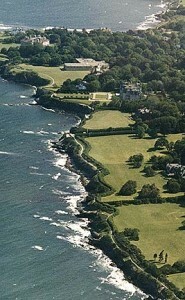 There are great views of the shoreline as well as the historic architecture found in Newport. To keep your energy up while spending time at Cliffwalk, try out this coffee cake recipe to start your day!